Dr. Schutz gave an invited performance at the Ontario Day of Percussion, sponsored by the Percussive Arts Society (PAS). The 30 minute recital included solo performances on vibraphone, marimba, and snare drum, as well as duets with flautist David Gerry, and percussionist Stefan Kitai. 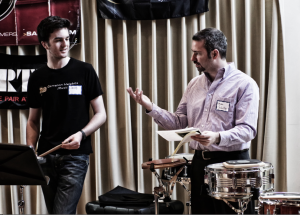 Dr. Schutz also participated in a snare drum workshop organized by Jay Boehmer, aimed at high school students from around the area. He is looking forward to becoming more involved with the Ontario chapter of PAS now that he has established permanent residency and is able to begin free-lancing once again.